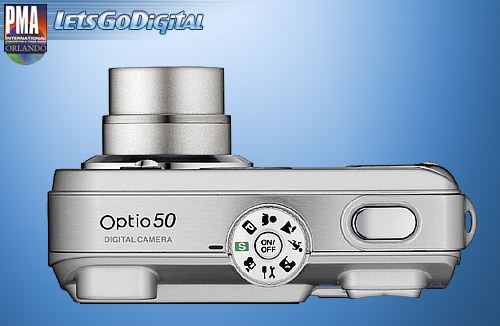 Pentax Optio 50 introduction : Pentax introduces the new Pentax Optio 50, a compact, lightweight digital camera that makes digital photography easy for virtually anyone. Incorporating a handy "Simple" mode, it allows the user to quickly choose an icon that matches the subject at hand and have the camera select all the optimal settings automatically for the best possible results. 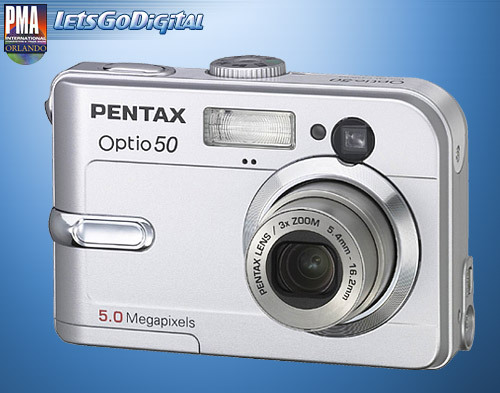 And to ensure easy use continues no matter where you go, the Pentax Optio 50 has also been designed to be powered by AA batteries, which are widely available internationally. But to be worthy of the Pentax name, of course, ease of use is not enough. Indeed, the Pentax 50 offers the power and clarity of a 3X optical zoom lens and the sheer detail and high-level resolution of 5.0 effective Megapixels, making it as sharp at shooting as it is easy to use. Compact, lightweight design: Despite its 3X optical zoom lens and AA battery compatibility, Pentax has succeeded in creating the Pentax Optio50 with compact dimensions of just 91 (W) x 61 (H) x 27 (D)mm and a light weight of a mere 130 grams. Furthermore, its chic silver exterior has also been specially crafted with rounded corners that make it feel more comfortable in the hand, while imparting a clear sense of user-friendliness. Mode dial for simpler mode selection: All the user has to do to select a shooting mode is simply turn the handy mode dial to pick the desired icon from a choice of seven. Also available on this handy mode dial are Portrait, Landscape, Night scene, and Movie mode, the latter of which enables movie recording with sound to the full capacity of the memory card. There's also the useful "Simple" mode, which lets the camera automatically select the optimal settings for the scene at hand. 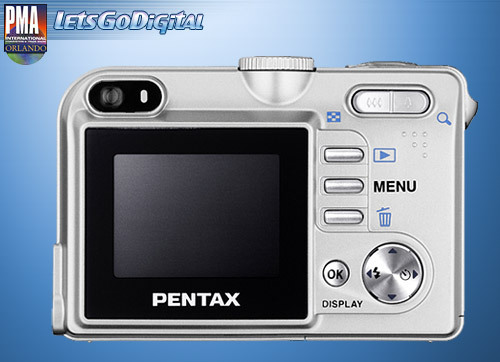 Impressive image quality: As the Pentax 50 incorporates a 3X optical zoom lens with two lenses that are aspherical on both sides, it is able to make the very most of its ample 5.0 effective Megapixel imaging performance. What's more, its 5.19 total Megapixel CCD is also complemented by a primary color filter, enabling it to achieve satisfyingly high-resolution images with vivid color. AA battery compatibility: The Pentax Optio 50 is compatible with widely available AA batteries (takes two alkaline or nickel hydride batteries) making it easy to replenish the power practically anywhere in the world. 1.8-inch LCD monitor: Despite its positioning as an entry-level model, the Pentax Optio 50 employs a large 1.8-inch, TFT LCD monitor with 130,000 pixels. As a result, composition and focusing are made much simpler when shooting, and images become much easier to evaluate during playback. PictBridge compatibility for direct printing: The Pentax Optio 50 supports PictBridge, a new direct-print standard released by the CIPA (Camera and Imaging Products Association). This impressive advance means there's no need to use a computer to make a printout, just connect the Optio 50 directly to a compatible printer via USB cable and produce printed photographs directly.